One scene I recently wrote just had the wrong focus. It was an assembly at school, where things got announced. But when I looked at it hard, I realized that my main character did nothing, except sit and watch the assembly happen. The secondary character was present and more active, but I hadn’t written it from her POV. Worse, I realized the conflict and emotion of the scene really happened as characters prepared to go into the scene. There were no surprises in the assembly itself. So, I could have gone back and withheld information from characters until the assembly. I could have devised something for the main character to do, something I did in an earlier scene revision. But this time, it felt right to just omit the assembly and instead do a couple short scenes: in one, the main character and his family get ready for the assembly; in the second, the secondary character and her family get ready for the assembly. The emotions were all in these two scenes, and actually provided better emotions. The assembly is actually cut and the reader (hopefully) will assume it happened. 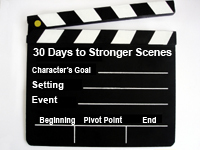 This scene cut will speed up the action of the story, moving past what the audience can safely assume to a new place of conflict. It should give me better pacing. Need to cut, but don’t want to cut out an entire scene? What are other reasons to omit a scene?